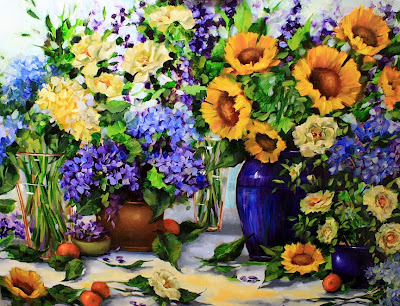 Summer Night is the newest container garden in Flower Mound Studio, and a painting that has been under construction for a few days now - my studio models held up beautifully, but I don't think tomorrow they will be quite as perky due to the muggy, warm weather in Flower Mound. Tonight I'll have to deconstruct this huge flower setup and spritz and spray and water, hoping these blossoms will survive just a few more days despite the bright lights in the studio. I'll be taking many of these elements with me when I host my next 3-day workshop in Fredericksburg, Texas, July 6, 7 and 8 at the Good Art Company School. 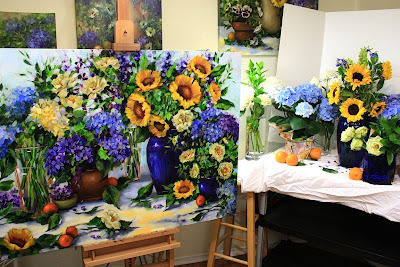 We'll be painting a variety of these fresh flowers during the workshop, and I can hardly wait to get back to this beautiful Hill Country setting. The Good Art Company School at Baron's Creekside Resort is the absolute perfect place to paint, with tons of sightseeing, shopping, and pastry shops nearby. We'll be painting each day from 8 am to 3 pm so we will have time to do a little shopping downtown in the afternoons. If the hubby stays home, I can visit my favorite quilt store with absolutely no adult supervision whatsoever! A stunning piece, Nancy! Love the color palette especially. I know your students will have a blast; it sounds so fun!